With very few exceptions, January flowers are hard to come by in a Colorado landscape. Not so in the tropical plant collections at Denver Botanic Gardens. The Boettcher Memorial Tropical Conservatory, Marnie’s Pavilion and the Orangery are a perfect venue for your winter floral fix. Clerodendrum × speciosum is a sterile natural hybrid that can be found in tropical regions of Africa. 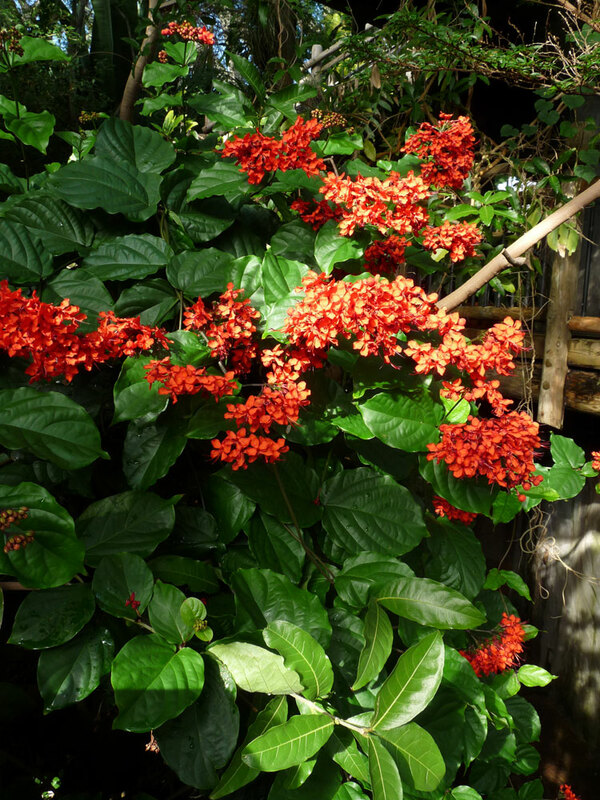 It’s hard to miss the bright orange flowers on this sprawling vine. Look closely and you’ll see that once the flowers have dropped, a bright purple calyx is left behind giving the impression that this plant is almost always in bloom. Look for this vine about halfway through the Tropical Conservatory on the south side. A little further along the south path is a beautiful specimen of Dombeya elegans – a hibiscus relative from southeast Africa. 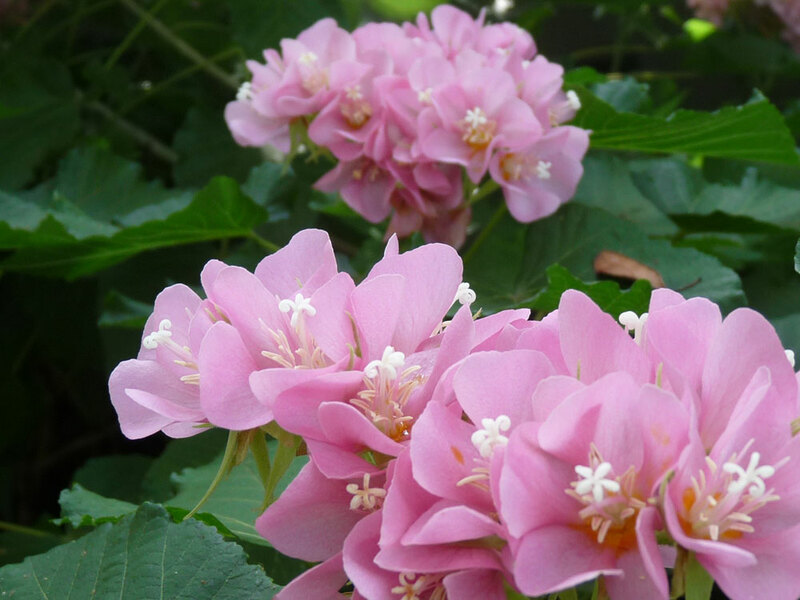 This plant is prized in tropical landscapes for its profuse winter blooms and it drought tolerance. Cross to the north side of the Tropical Conservatory for a beautiful display from Heliconia orthotricha. This species is native to Ecuador and naturally has many color variations. Ours is a bright mix of orange, red and yellow. You can’t miss it. Exiting into Marnie’s Pavilion, take a moment to appreciate the powder-puff-like blossoms of Calliandra surinamensis. In the wild, members of this genus cover a wide range. 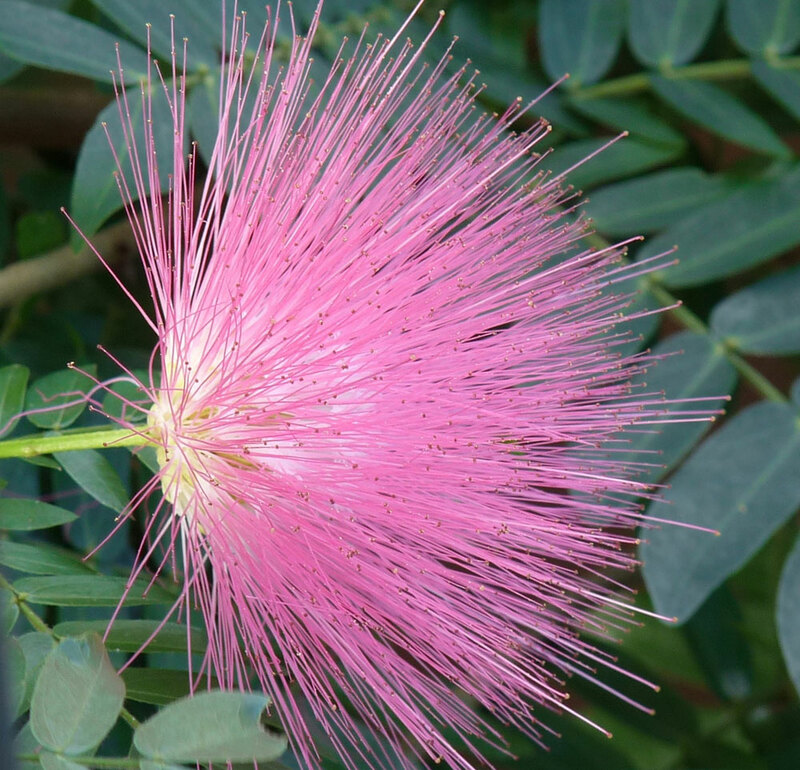 But as the name implies, Calliandra surinamensis can be found growing wild in Surinam as well as other parts of northern South America. The colorful flowers of the legume attract nectar-feeding birds and butterflies. 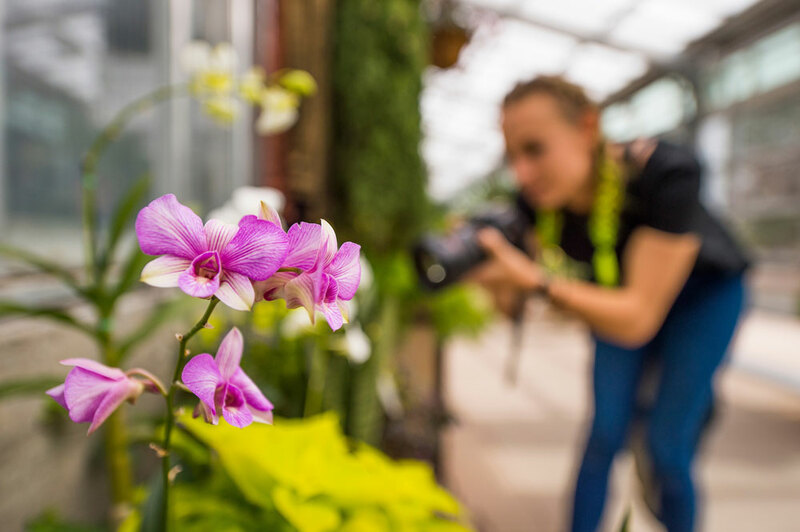 You can finish your tour of blossoms in the Orangery where you can relax and enjoy the display of orchids in our annual Orchid Showcase, Jan. 10 – Feb. 17, 2019. Hundreds of blossoms will help you forget the worries of the day and plenty of benches are available for you to sit and decompress.